Professional quality, ease of a toy... FINALLY! MicroDelta Rework 3D printerEco-participation : 0,79 € VAT inc.
MicroDelta Rework heatbed complete KitEco-participation : 0,08 € VAT inc.
With the success of the MicroDelta Original, and based on our five years experience on 3D printer development, the eMotion Tech company is proud to introduce its latest creation : the MicroDelta Rework. Don't be afraid with Technology : well designed, it becomes easily accessible to everyone! A 32 bits electronic board, dedicated to the delta robots movements, eMotronic 32 bits, that permits high speed moves without any loss of quality. Indeed, the eMotronic boardclocked at 96Mhz, enables a smoother calculation to pass from the carthesian space to the delta cinematic. The structure is made by two folded steel blocks, that highly limit the quantity of subassemblies and small parts to build it. This procures a high rigidity and ease of assembly. Linear bearings have been replaced by slide bearings. Thanks to the feedback from the users of our former 3D printer, we have chosen these bearings because of their long lifetime and limit the wear of the guiding shafts. We have chosen injection moulding to manufacture the linkages, that drasticly decrease the variance (the range in length between the 6 linkages), offering a perfect geometry of your printed parts. The 10mm guiding shafts with threaded holes enable an ease of use and an increased rigidity of the machine. 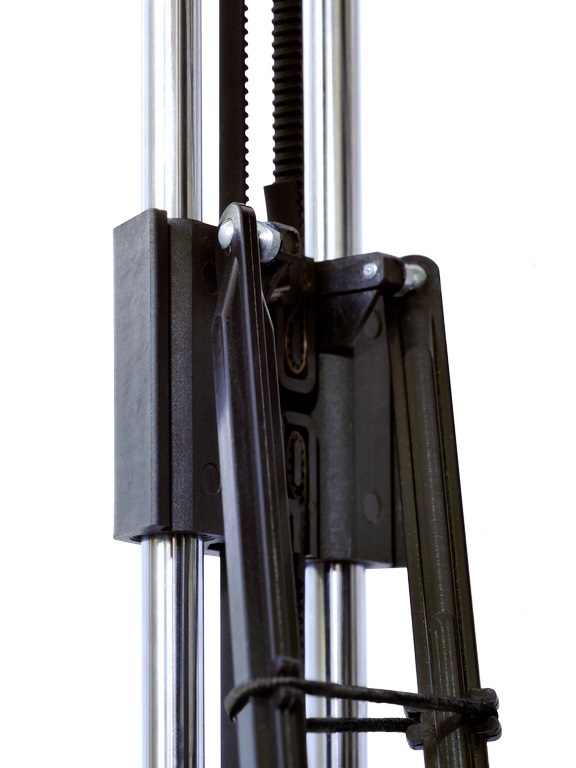 The plastic injected sliders offer a perfect alignment between the bearings. A disengageable extruder to take off or engage the filament with a simple fingers pressure. Manual extrusion of the filament made by a molded wheel to have a very sharp flow. No clearance or empty space on the path of the filament, so it's possible, even if it's a bowden extruder, to print with every kind of filament available on the market, flexible filaments included. Suitable cooling for either small and large parts printing, and the use of technical filaments. MicorDelta Rework has been conceived and produced using dedicated manufacturing methods such as machining, folding, injection which provide an outstanding stability and rigidity. No use of threaded rods, neither structural printed parts with random tolerances. At the eMotion Tech company, we first value the quality. To get the best of the delta cinematic, which allows fast movements and high acceleration, we have developed a 32 bits, 96Mhz clocked electronic board able to generate smarter and more efficient movements in compare with other 3D printers on the market. Printing volume: Ø 150mm, hight 200mm.